International Women’s Day—March 8—is one of my favorite days. It is a time to celebrate the impressive progress women at all levels of the career ladder have made in recent decades. More women in the labor force, and in more senior positions is good news for women, for their companies, and for their countries’ economies. A new IMF staff study finds that in Europe, national policies, even taking account of personal preferences, can boost women’s participation in the workforce and enhance their chances for advancement. The research, which looked at 2 million firms in 34 countries in Europe, also finds that the more women in senior managerial positions and in corporate boards, the more profitable firms are. One more woman in senior management or on a corporate board is associated with 8–13 basis points higher return on assets. High corporate profitability could support investment and productivity—another channel through which more women in the workforce can help mitigate Europe’s potential growth slowdown. The results are clear: increasing female participation improves the bottom line. In regions like Europe, where populations are aging, the working-age population is being squeezed, and productivity growth is declining, there is more incentive than ever to level the playing field for women to work full-time and climb higher up the ladder. Over the past three decades, millions of women in Europe have joined the labor force. Countries such as Spain and Ireland have seen the share of women who work outside the household double since the 1980s—from under 40 percent to more than 80 percent in the case of Spain. In several Nordic and Eastern European countries, women today are almost as likely to work for pay as men are. At the same time, legal requirements for gender diversity in corporate boardrooms have helped boost women’s representation in top decision-making positions—women now hold almost a quarter of senior management or board positions in the corporate sector. Still, there is scope to bring more women into the labor force. 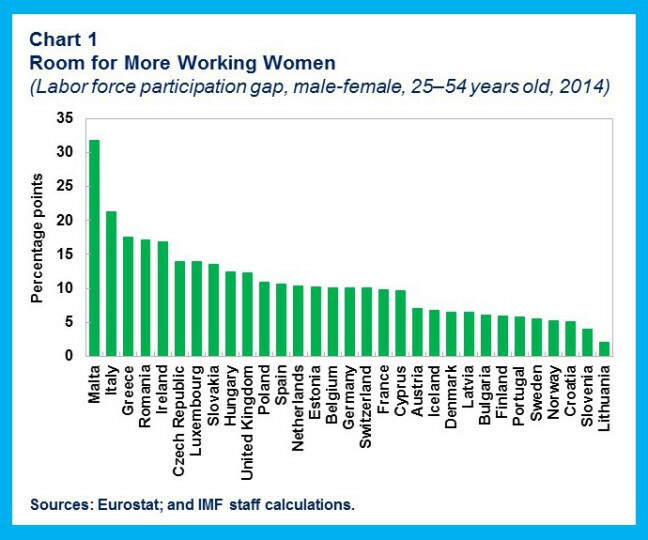 In almost all European countries, women are significantly less active in the labor market than men. Even those women who are employed often work less than full-time. Although women today make up almost half the European labor force aged 25-54, their representation on the top rungs of the corporate ladder is significantly below that of men. Clearly, women’s personal preferences and attitudes toward working are important determinants of their decision to join the labor force, as our staff’s research confirms. This is especially true in Europe, where women today face no legal restrictions to employment, are just as educated as men, and have fewer children—and social norms have changed. But the study finds that policies also have an important influence on women’s employment decisions, even after accounting for individual characteristics, choices, and preferences about working. Removing tax disincentives for the second earner in a family, providing sufficient childcare services, and allowing parental leave can broaden the opportunity for women to work as much as they want. First, more women in the labor force will expand labor supply. If women choose to participate in the labor market as much as men do, Europe’s workforce could increase by 6 percent. If they also choose to work as many hours as men, the workforce could grow by as much as 15 percent.Second, the prevalence of full-time female employment is a strong predictor of the share of senior corporate positions held by women. And more women in senior managerial positions and in corporate boardrooms, the IMF staff study confirms, is associated with stronger firm financial performance, which would help support corporate investment and productivity, further mitigating the slowdown in potential growth in Europe. The positive relationship between more women high on the corporate ladder and firms’ profitability is more pronounced, the study finds, in sectors where women form a larger share of the labor force—highlighting the importance of bridging gender gaps between senior executives and the general workforce. This positive association is also more evident in knowledge-intensive services and high-tech manufacturing sectors—where diversity, including gender diversity, can help meet the high demand for creativity and innovative capacity. As we celebrate women’s achievements in Europe’s labor force, we must also acknowledge that the journey is still in train. The potential benefits can be large. We must not miss this opportunity.